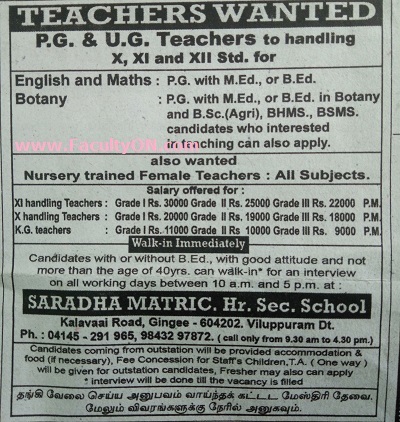 Saradha Matric.Hr.Sec.School, Villupuram has advertised in the DINATHANTHI newspaper for recruitment of Non-Teaching faculty-Teachers PGT / TGT / NTT jobs vacancies. Interested and eligible job aspirants are requested to walk-in immediately on all working days from 07th October 2018. Check out further more details below. Botany- PG with M.Ed or B.Ed in Botany and B.Sc (Agri), BHMS, BSMS. How to Apply: Interested and eligible candidates with or without B.Ed are requested to attend the Walk-in interview along with CV, originals & copies of certificates and PP size photos to the walk-in address given below. Immediately on all working days from 07th October 2018, 10:00 am to 05:00 pm. Note that the interview will be held until the vacancy is filled, but not sure when it filled. So it is better to attend the interview earlier.